This Friday, Jean-Claude Van Damme reruns to the big screen in his latest action epic Pound of Flesh. And in a move to promote the movie, he made an appearance on last night's Conan. It was here that the host convinced the action icon and living legend to recreate one of his most infamous scenes. Yes, that's right! 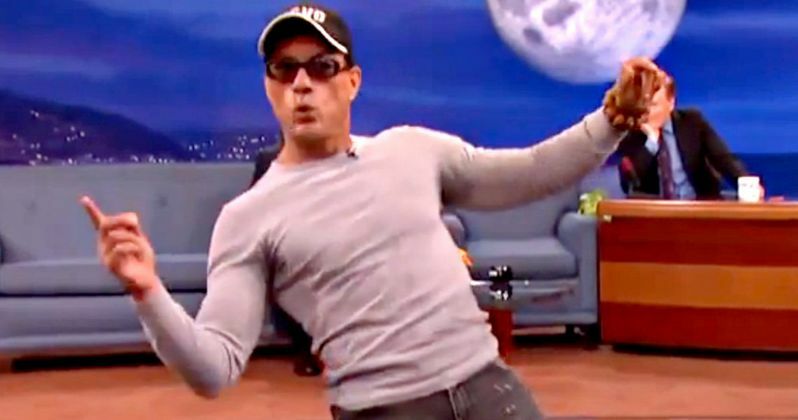 Wearing dark sunglasses and a ball cap as if in incognito, Jean-Claude Van Damme busted out his dance moves from the 1989 classic Kickboxer. What many people forget or do not realize is that before he was a black belt karate and bodybuilding champion, Jean-Claude Van Damme was a classically trained ballerina who studied ballet for more than 5 years. He put those skills to good use in his breakout role as Kurt Sloane in Kickboxer, which brought the star to acclaim, and made him on of the biggest action mainstays of the 1990s. While Kurt's main goal in the movie was to learn the ancient art of Muay Thai to avenge his brother, he had time to break out a dance that would be remembered in the annals of cult film history forever.